The Wright brothers' 1903 Flyer plane, side view. The prevailing winds of Kitty Hawk where author Tara Staley set her new novel, Conditions Are Favorable, can blow a person, a ship or a flying machine right off course. The known course for books featuring the Wright brother's first flight experiments in Kitty Hawk begins with the iconic brothers as confirmed bachelors. The predominate presumption concerning their fondness for single-hood and dandified appearances positions them as latent homosexuals. Others who knew them well claimed they were simply odd and "woman-shy." Yet, no one has ever examined the brothers through the spectrum of autism. Until now. In Conditions Are Favorable, Staley presents a daring connect-the-dots story suggesting that not only were Orville and Wilbur Wright on the autistic spectrum, they were affected specifically with the yet-to-be named Asperger's Syndrome. With luminous prose true to the era and gentle use of the remote region's dialect, Staley explores the religious, cultural and political edges of the period leading up to the Wright's successful experiments in human flight. It was the age invention, the turn-of-the-nineteenth century, when two engineering brothers changed their obsession from manufacturing bicycles to designing flying machines. Staley begins with the fictional Madeline Tate, a smart and spunky unmarried woman on the verge of becoming a spinster. Growing up among the old salts and sea pups of this remote barrier island, Madeline is something of a pearl trapped in an unyielding oyster. She longs for romance, but not with one of the grizzly-faced, whisky-soaked fishermen who overrun the island. When the Wright brothers choose Kitty Hawk as the staging place for their experiments in flight, Madeline's life takes off. She sees them through eyes of need, desire, and adventure, spinning a romance around one of them that tests him as much as it does her. Conditions may be favorable for flight, and conditions may be favorable for romance, but are conditions favorable for love? Full disclosure: Tara Staley is a friend of mine. Still, I'm here to say she's also a damn fine writer. Her first novel, Need to Breathe, floored me with the unforgettable duo of "corporeal agent" Millie Rose and her charge Claire Harper, a feisty young woman who survives a botched abortion at 26 weeks. Conditions Are Favorable is just as gutsy, just as gritty, and just as beautiful as Need to Breathe. I caught up with her on the eve of publication for Conditions Are Favorable and captured the following interview. The Wright brothers claimed their intense focus on work left little time for romance, and thus, neither brother married or was known to have had a significant romantic relationship. Connecting the dots between the historical record, the epigraphs preceding each chapter, and the story within your novel, it's easy to theorize that the Wright brothers had Asperger's Syndrome. Is that what your research led you to believe? Yes, but it took a combination of research and real life experience. When I first became a Wright brothers enthusiast, I read two biographies, noted their peculiar behaviors and kind of shrugged it off without having the slightest clue. A few years later, my husband and I welcomed our first son William into our lives, only to be devastated with an autism diagnosis in December 2004. William could not say or nod the word "yes" at age three-and-a-half. He was fascinated by the texture of grass, loved swatting at the little yellow key dangling from the electrical box out behind the house, and running his hands under water. He obsessively lined up his blocks in front of the fireplace and made a beeline for the doorway whenever we were in crowded rooms. Consequently, I absorbed more literature on autism spectrum disorders and Asperger's Syndrome than for my major in college. I met other kids, prayed, talked to other parents, attended programs, contacted organizations, scheduled appointments and therapies, and enrolled William in special preschools. So by the time he was nine-years-old, he was being mainstreamed into a regular classroom at school. His IQ had risen from the 50s to the 90s, with above-average and "superior" scores in math and matrix reasoning. He is truly a budding scientist! William carefully lining up his alphabet blocks along the fireplace. If I even turned one slightly off, he noticed and corrected it. They had to be this way. I'll never forget that moment, when I slapped a hand to my face and blurted the Great Epiphany: "The Wright brothers were on the spectrum. For crying out loud!" Even though they weren't as severe as my son, suddenly everything about them made sense to me. Their affinity for machines. Their aversion to women after being rejected once in courtship. Their intense bonding as brothers. The high intelligence. The mistrust of others, their general aloofness from the world and the self-focus in their letters. Some media sites and pundits claim the Wright brothers were latent (repressed) homosexuals. Did you find any evidence of that in your research? I seriously thought about this and looked it up a couple of years ago, first trying to understand homosexuality from a psychological perspective. Claims that the Wright brothers were homosexual are looking only at the fact that they never married, they lived at home, preferred wearing neat and fashionable clothes, and were very close as siblings. It's an easy conclusion to draw on the surface. But you have to dig deeper to form a more complete psychological picture of a person, and Asperger's Syndrome explains all their behaviors -- including their bachelorhood --much better. Why do you think Wright brothers scholars or first flight historians have never explored the possibility that the Wright brothers had Asperger's? I was recently contacted by Simine Short, an early aviation scholar who has published a biography on Octave Chanute. Because of Chanute's connection with the Wrights, Short was somewhat familiar with them, and she remarked that "I thought they were just good mechanical tinkerers, they worked on [the flying machine] until it did what they wanted it to do" but the Asperger's connection "makes sense once you think about it." She said she wasn't familiar with autism and didn't know anyone who had it, so this is probably why the connection hasn't been made among Wright scholars. Having an autistic child is the only reason I recognized it. Asperger's Syndrome is a relatively new diagnosis on the autism spectrum. Could this be a reason why scholars have never made the association between the Wright brothers and Asperger's? This might be a possibility. According to Wikipedia, Hans Asperger was the first doctor to describe it in 1944. But it didn't become standardized as a diagnosis until the early 1990s. The biographies I perused were published in the late 1980s and mid-1990s, and some new editions of these appeared in 2003 and 2011. I conducted frequent Internet searches on "Wright brothers Asperger's" or "Wright brothers autism" and came up dry, so I'm assuming the new editions do not address it. The biographies tended to focus more on the story of the invention of flight rather than looking at the brothers psychologically. However, Adrian Kinnane's The Crucible of Flight does explore the Wright brothers' family and fraternal bonds, as well as their external social relationships. As the paper is unpublished, I haven't read it and can't say whether or not Dr. Kinnane ever drew the same conclusions I did. 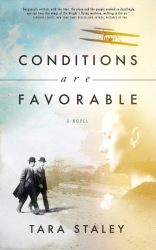 Conditions are Favorable features a fictional woman cast into the life of two recognizable historical figures, the Wright brothers. How did you come up with the idea of Madeleine, and why did you choose Orville Wright as the object of her affection? Madeleine is the embodiment of turn-of-the-century Kitty Hawk, NC. I wanted to contrast her harsh, rugged reality with the more genteel world represented by the Wrights. She is a Cinderella-type character who becomes fascinated with the "Outside World's" charm and elegance and desperately wants to join it. This, in turn, drives a lot of the tension between Madeleine and the brothers. "Which Wright brother" was the first question I asked myself! It became obvious early on in my research that it had to be Orville, for several reasons -- historically, he did come pretty close to marriage. Remarks he made in some of his letters showed that he noticed pretty ladies and had a fondness for them. He had a more gentle, likeable disposition compared to Wilbur. The Wrights' niece Ivonette remarked in a documentary that Orville was "the more approachable of the two." I found the only known recording of Orville's voice in a little promotional film made by the Dayton Engineers Club in 1935. He seemed so awkward and unsure of himself in front of the camera, to the point Catherine DiCairano, one of my writer-friends said, "I just want to run up and give him a hug!" And finally, Wilbur must have known that Orville was quite "susceptible" to women because he wrote: ". . . I have cautioned [sister Katharine] to guard against internal injuries under the ribs of your left side. Hospitals are awfully dangerous places for bachelors." I think Wilbur's depiction of romance in this letter (as injurious and "dangerous") shows how cynical he was about it, probably from being rejected in courtship as a young man two decades earlier. Does Madeline ever notice how dandy and different the brothers are from the locals? Does she ever wonder if they are somehow "touched" or have some kind of character oddity? What conclusions does she make? The ginormous difference between the Wright brothers and Kitty Hawk men is exactly what appeals to Madeleine, from her very first encounter with Orville in the prologue. As a character, she's one of the few Kitty Hawkers (along with her family, the Tates) who sees a problem with the rogue way of life that results when a community is geographically cut off from mainland civilization. Although she doesn't compare the Wrights to magicians per se, she does see something almost "divine" in them because they are so intelligent. But as she becomes more familiar with them and pursues Orville's affection, their social limitations become a huge hurdle she must jump. She tries on many occasions to coax Orville out of his shell. Of course there was no Asperger's diagnosis a hundred years ago, so she doesn't draw that conclusion. She sees it as shyness at first. What is it about Orville that captures Madeline's fancy and how does she change through the course of knowing him? He loved children and children loved him. He cooked taffy and caramel for his nieces and nephews. When he and Wilbur babysat, they performed shadowgraph shows. Madeleine says in the course of the narrative that he would be "such a good daddy." A man who is a natural around kids is a huge plus, even for today's standards. Orville was also very particular about his clothes. His niece Ivonette remarked "everything had to be just right" in regard to the way he looked. (My autistic son obsesses about clothes as well -- he goes through a "clothes straightening" ritual every time he transitions between, say, the car and a building. He never wants his tummy uncovered; he refuses to talk when he's naked for his bath. He'll dash madly over to a complete stranger to pull their shirt down if it rides up. It's usually an OCD issue.) So if Madeleine is like Cinderella, here is her well-dressed prince. And when juxtaposed with Kitty Hawk's "old salts," outlaws and poverty, Orville's dignified appearance is what triggers her transformation from a poor country girl who lives in fear, to a "lady" who respects herself and believes that anything is possible. The Outer Banks of North Carolina where Kitty Hawk is located play an important role, almost as if they're a character in the story. Why did you give the region such a large part? Anyone who's visited the Outer Banks would testify they have a disposition all their own! I find it fascinating that the same weather that wrecked ships and flooded homes was the same weather that gave victory to the Wrights on December 17, 1903. So in a sense, Mother Nature went through the whole gamut of moods and emotions that people experience and, therefore, she had to play a major part in the story too. 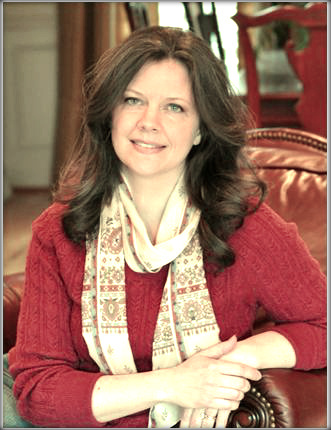 Writing a novel is a personal journey as well as a creative endeavor. Did you learn anything about yourself while writing Conditions Are Favorable? Wow, this is a biggie... because writing biographical fiction presents challenges not present with the other genres and you DO learn a lot about yourself. You learn through this other person's life, particularly if you write from his or her point of view. At first I was intimidated to look at the world through Orville's eyes. I thought the challenge was huge -- it wasn't just writing from the point of view of the opposite gender, but from a famous inventor, to boot. Who likely had Asperger's. And a knack for engineering. But I learned more than just how the first airplane was designed. I learned that it's okay to dream big, that even the impossible is possible. I learned more about autistic spectrum disorders and how to relate to my own son by writing from the point-of-view of an Aspie. But most of all, I learned that many of the burdens we bear, the Crosses we carry, the afflictions we suffer, can be used by God to bless us beyond measure. I'm not sure the Wrights would have been able to succeed if they hadn't been "blessed" with Asperger's. Thanks for the interview and sharing my book with the HuffPost community!